The ninth edition of Sikka Art Fair (Sikka), a pillar event of Dubai Art Season, opened yesterday (March 16) at the Al Fahidi Historical Neighbourhood in Dubai, UAE to run until March 24. Sheikha Latifa bint Mohammed bin Rashid Al Maktoum, vice chairman of Dubai Culture & Arts Authority (Dubai Culture), who inaugurated the event, toured the fairgrounds accompanied by Afra Al Basti, director general of the Dubai Foundation for Women and Children; Dr Rafia Gubash, founder of Women Museum; Dr Hessa Lootah, assistant professor at UAEU’s Mass Communication Department; Muna Bu Samra, editor-in-chief of Al Bayan Newspaper; and artist Fatma Lootah. Sikka is held alongside Art Dubai, DIFC Art Nights, Galleries Night at Alserkal Avenue and Emirates Airline Festival of Literature among other events. Sikka’s ninth edition, organised under the Dubai Art Season umbrella, will feature artistic manifestations of tolerance, complemented by visual depictions highlighting coexistence, openness, and cultural diversity in societies. The annual art initiative was launched by Dubai Culture to celebrate Dubai's burgeoning creative and cultural landscapes. The fair also plays host to a range of activities, initiatives and talks moderated by artists including live musical performances, research initiatives, interactive meetings, and educational activities, all of which feature works by emerging talent based in the UAE and the GCC. Sheikha Latifa commented: “The youth hold a special focus within the vision and direction of my father, His Highness Sheikh Mohammed bin Rashid Al Maktoum, Vice President and Prime Minister of the UAE and Ruler of Dubai, as they are the future of our beloved nation. Supporting their growth and ambitions and guiding them in their pursuit of excellence within their chosen field is of utmost importance to us in Dubai Culture. The ninth edition of Sikka Art Fair returns to the pulsating heart of historic Dubai with nine days of art, talks, music and creativity, taking visitors on a storied journey through the multi-faceted city that never sleeps. With 48 commissioned artists and a lively programme of performances, workshops, and film screenings, Dubai Culture continues to work diligently to make Sikka Art Fair becomes the platform that allows young emerging artists from the UAE and the GCC to showcase their work as well as gain inspiration from their peers to keep honing their talent. This year's edition saw over 400 applications, 48 of which were selected from regional artists, who developed their artistic research around this edition’s theme to support the ‘Year of Tolerance’ initiative. This year, the fair will host 23 Emirati artists, accounting for 48% of the total number of exhibitors, as well as Arab artists representing Jordan, Palestine, and Syria, amounting to 19%. Artists from the Indian subcontinent comprise 17%, while artists from Europe, the United States, Australia, and South America will account for 16%. The fair supports young talent from the UAE and the region by providing them with opportunities to showcase their works to art patrons, critics, and the wider public. This edition also features the ‘Zayed University Students’ House,’ organised by 30 Emirati students who are giving performances that delve into the challenges and concepts that play a part in shaping the UAE’s future. The students are also showcasing artworks that highlight the UAE's heritage and the adverse effects of climate change and its risks on sensitive, local ecosystems. 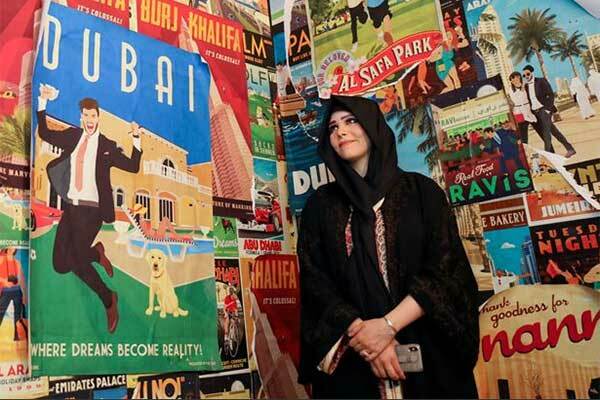 This special corner also includes paintings, photos, and films that depict the UAE’s history, customs, and traditions as well as the urban developments that transformed all its Emirates.